For the last year I've shared a studio with Sarah Drake, a graphic designer who makes wedding paper suites (among many other things). Sarah's work is beautiful and it's tempting to romanticize days spent with paper and ribbon. What I would like to share about Sarah's work, and the work of graphic designers who work on weddings, is the specific and undivided care that goes into making custom wedding invitations. Most of Sarah's work happens before production. Production comes after the consultations with her clients, selection of all the papers and fonts and details like ribbons and liners, after the wording is figured out, decisions on calligraphy are made, and the invitations are printed, and after all the email and phone conversations have been had. I don't know much about all of that, except that that is the majority of the work. Once Sarah gets the paper back from the printer she begins her production--it's the home stretch. Production is the physical assembly of all the printed and calligraphed elements: the invitation, response cards, enclosures, envelope liners, and all the final details, ribbons, wraps. Most of Sarah's clients choose their invitation designs entirely from scratch, and each production comes with new specific demands. More than anything Sarah's work is aimed at making all the pieces work seamlessly. It's easiest to see how complex something is when when it breaks down--true enough for cars and relationships as wedding invitations. What you won't see in these pictures is the envelopes that came in the wrong shade, and printing that had too much ink, and, when you look closely, the dark brown ink on the return address that doesn't match the black ink on the front--no longer seamless. You won't see the revisions to text that was too large, and the changes in the kind of wrapping for the invitations. You won't see the press-check, and the trips to the ribbon store, and the florist and back to the printer. You won't see the myriad decisions and work at every stage that go into making the end look like it all just goes together, simple, seamless. 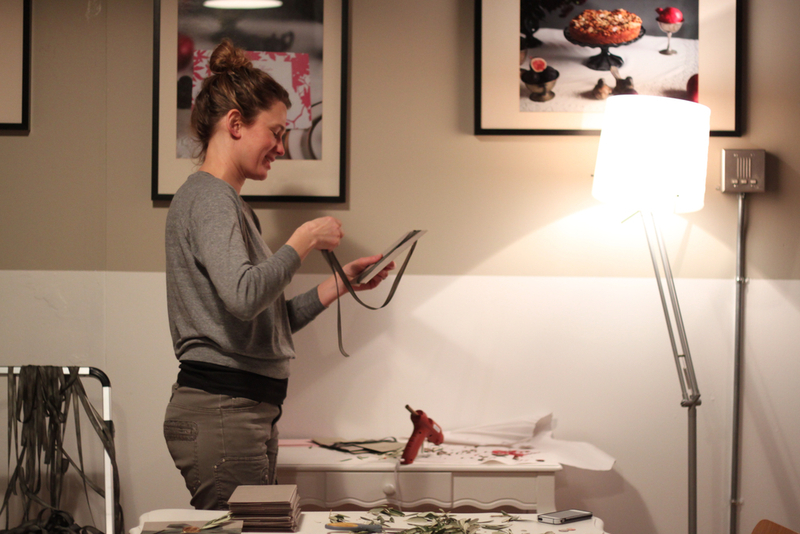 Here are the last stages of production for Sarah and her studio manager Emily Malven. Sarah brushes off extra flecks of rose gold edging from every invitation before they go out. Emily tea-stains invitations that were designed to look and feel like an old telegram. For a May wedding, Sarah wrapped every invitation in metallic tissue paper, wrapped with a hand-dyed ribbon, added a small spring of olive branch and sealed it with the couple's initials in a gold wax seal. 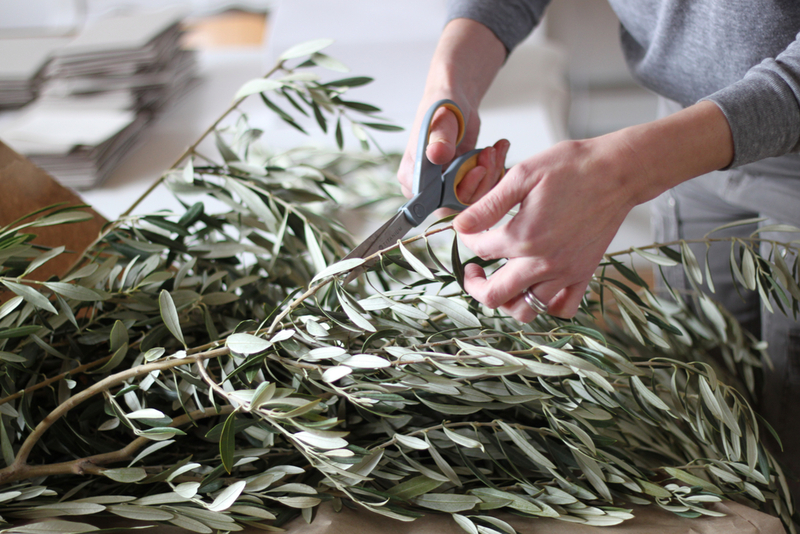 The tissue folding, ribbon wrapping, olive sprig cutting, and wax sealing took the better part of a day and evening. 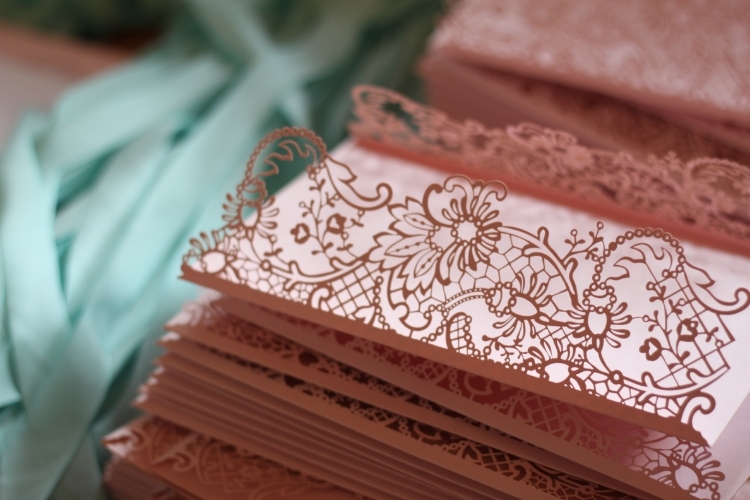 For a wedding in Portugal, Sarah designed the invitation enclosure from antique lace to be delicate laser-cut gate folds, tied with silk ribbon. After the invitations were glued to the enclosure, she weighted them overnight with books so the gate folds would lie flat. For a couple that works with horses, Sarah and Emily lined the envelopes with a favorite painting the couple chose.